"1. We can confirm Minecraft: Story Mode is a licensed 5-episode interactive narrative series coming to our service this fall. It's an extension of our other interactive stories we have on our service like Stretch Armstrong: The Breakout, Puss in Book: Trapped in an Epic Tale and Buddy Thunderstruck: The Maybe Pile. 3. We don’t have any plans to get into gaming. There’s a broad spectrum of entertainment available today. Games have become increasingly cinematic, but we view this as interactive narrative storytelling on our service." Netflix and Telltale Games have entered into a deal that will bring simple game experiences to the streaming service. Netflix has confirmed that a streamable version Telltale’s Minecraft: Story Mode that will offer an adapted version of the Telltale Games original. 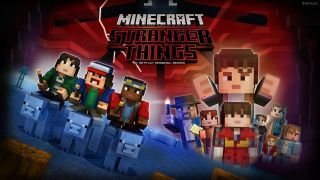 Like the Telltale Games series, Minecraft: Story Mode on Netflix will be a five-part episodic adventure and would be available to stream later this year. Separately, we've learned of a new Telltale Games project based on Netflix’s hit series Stranger Things - though no release window or additional details were provided. Our initial impression was that Netflix's version of Minecraft: Story Mode would be delivered via video files and will accept commands via any remote equipped with directional and select buttons. That appears to be inaccurate and it will instead play similarly to titles like Puss in Book: Trapped in an Epic Tale and Buddy Thunderstruck: The Maybe Pile, which let younger viewers choose how the story unfolds. Telltale has mentioned wanting to work with the streaming service in the past on several occasions, and it appears that request has finally come to fruition. When asked what a final product might look like, sources pointed to the Amazon Fire TV platform – an ecosystem in which you can find a number of Telltale Games series like Minecraft: Story Mode, The Walking Dead, The Wolf Among Us and Marvel’s Guardians of the Galaxy – and which only requires that viewers have a remote in hand. That said, it now sounds even simpler than that. Depending on how much is cut out from the experience it might not end up looking different than some of the choose-your-own-experience titles Netflix already has on its service. The deal could potentially raise eyebrows with Telltale’s other content collaborators, notably HBO, a longtime partner of the developer for its Game of Thrones game. However, sources have confirmed that HBO was among the companies approached when the idea was conceived and turned Telltale down, saying they’d rather wait and see how the technology developed. Back in December we reported on the possibility of Netflix offering branching path content, and had even pointed to Telltale’s The Walking Dead or Game of Thrones as perfect examples of limited interaction experiences that could fit with Netflix’s technology. As for the yet-unannounced Telltale Stranger Things game, sources say the game should have been ready for launch in the autumn of 2017, but was pushed back to a later date. It’s likely that both the partnership and new game could be announced simultaneously. Update #2: There appears to be a job listing on Netflix's website for a Manager of Interactive Licensing who will, among other things, "use games as a marketing tactic to capture demand and delight our member community (ex: Stranger Things: The Game)". This role will likely be pivotal in bringing more interactive experiences to the platform in the future, and potentially lead to more Netflix-branded game crossovers. Matt Swider has contributed to this report.